Here at CAST, we LOVE teaching. Do you? 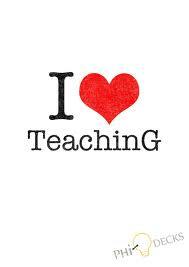 What about teaching do you love? Teachers often cite working with students as the number one reason why they love teaching. What about working with students makes YOU continue to love your job? Mathissexy?, PhiloDave?, Anonymous?, Realist? 12keystrokes?, Speechfromtheblock?, Marta? No, not just the same (old) familiar voices! Let’s hear from ALL of YOU! Let’s improve the situation for our adjuncts/students! Have your students sign the petition for a fair contract! Those were the days. Ugh. Floyd’s point at the SotC on Friday was right on. Adjuncts are the silent, mistreated, valuable, and overly relied upon workhorses of our students’ education. Since you directly asked, I can do no less than honor your request, casthwc. I have my passions. Teaching, you can say, is one of them. But learning tops teaching. That’s what I “love” about teaching. I “love” what my assigned students teach me.